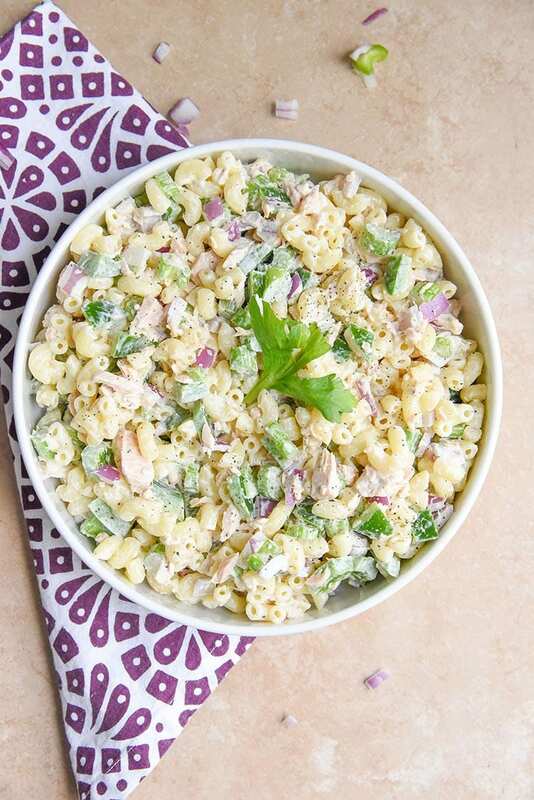 Tuna Macaroni Salad can be made in less than 15 minutes! 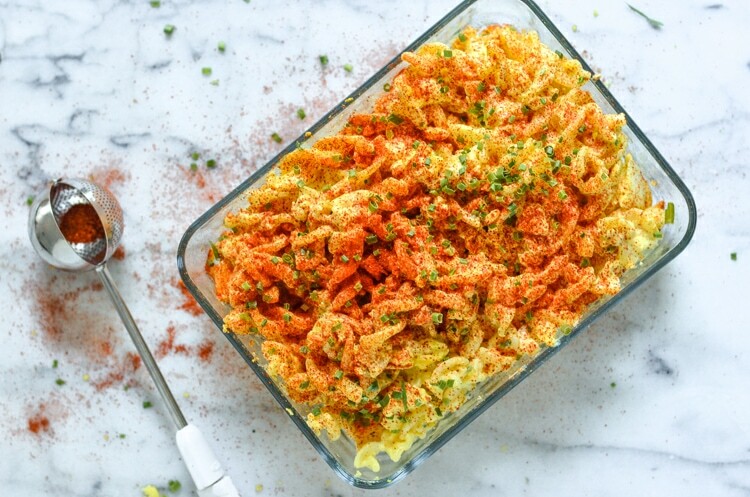 It’s a versatile recipe meaning if you don’t want to make macaroni salad with tuna you can swap in chicken or even leave the protein out. Great for potlucks, keep it chilled as it’s a cold tuna macaroni salad with mayo. 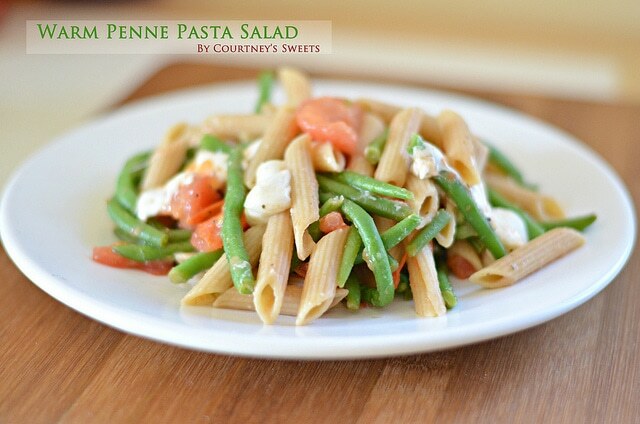 I grew up eating this recipe so often that whenever my mom made pasta I knew she was making macaroni tuna salad. 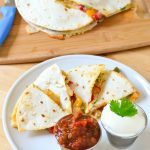 Make it, and you can bring it tomorrow to your a party too! 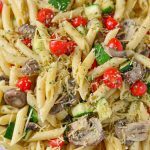 We love it the next day, and this is one of our favorite tuna pasta salad recipes, everyone loves it! 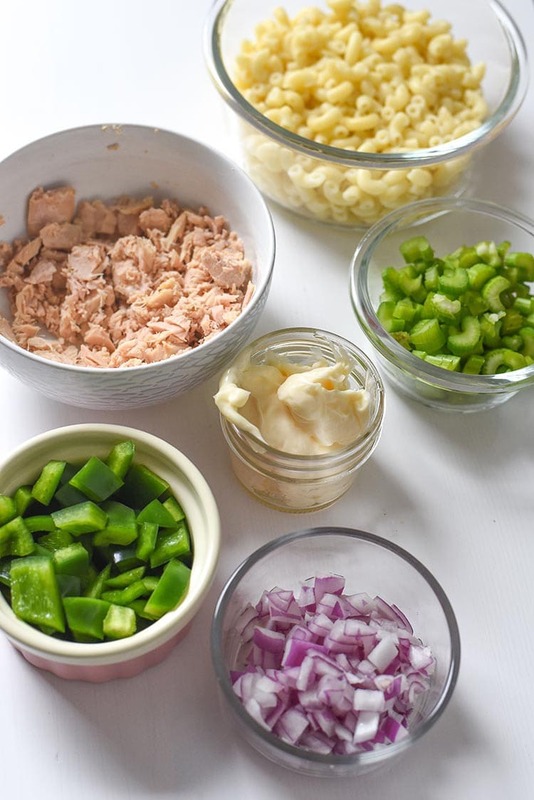 Growing up I remember running to the kitchen with my mother to make Tuna Macaroni Salad Recipe for the holidays. 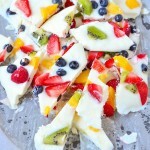 We loved just to eat this regularly too; it was a family tradition to make together. I’m so excited that my daughter and I make it together too. 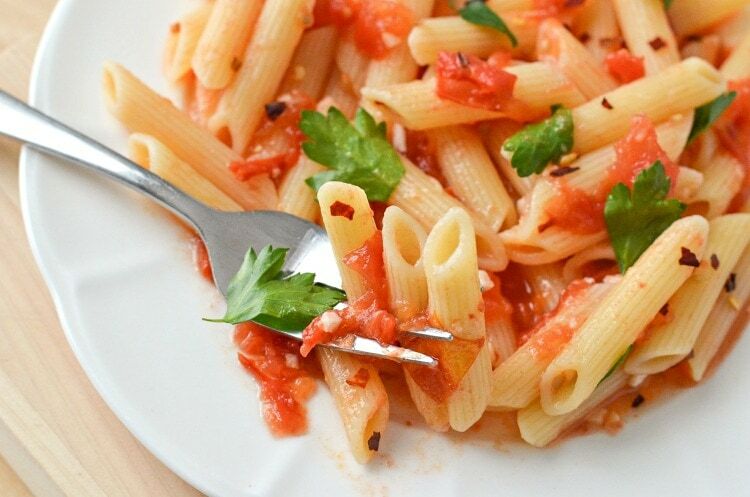 When we’re making pasta, I love using a strainer that doesn’t need much effort to use. 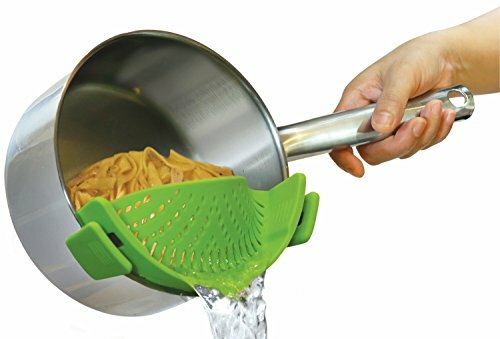 I want an effortless strainer, and this one is my go-to strainer for pasta, it’s even great for vegetables and potatoes. My sink is never empty (such is life!) so it’s not so easy to just plop the strainer into the sink when you’re mid-recipe and have a cutting board, utensils and your kid’s cereal bowl in there. What to do? I love using a snap-on strainer so that I can strain the pasta with one hand, or even potatoes! When you make this, you could enjoy it right away, but we prefer to enjoy our tuna macaroni salad cold. If you wanted to make this a healthy tuna macaroni salad you could use healthy food swaps like avocado and yogurt, but to stay true to tradition we shared my mom’s way, but we did use organic mayonnaise! 🙂 Not much has changed, aside from us purchasing canned tuna with less mercury. We also make sure our canned tuna is wild caught. Since our family loves tuna so much having less mercury is a big deal. Now if you’ve read about what foods are off-limits during pregnancy canned tuna and pregnancy don’t usually go together, but if you have to have it, you can find it with less from several brands now. 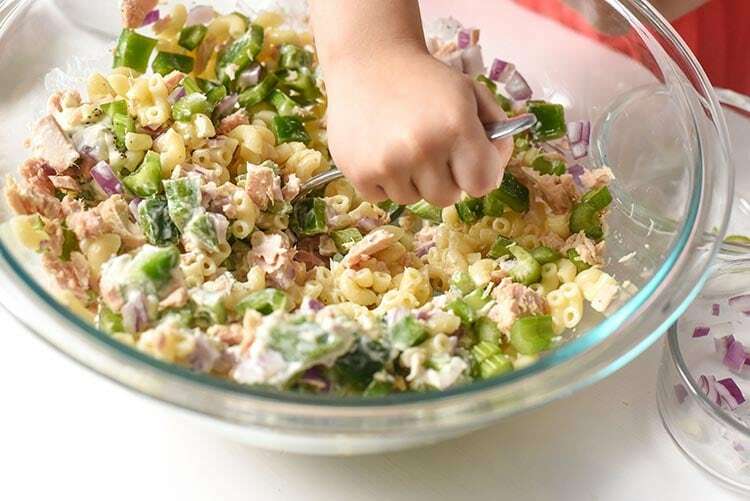 We like to keep our tuna macaroni salad pretty simple and just the way my mom made it. She used white onions, but I like to use red onions for color. If the red onions are too strong for you sweet onions (sweet Vidalia onions) make a great alternative or even some sliced scallions. 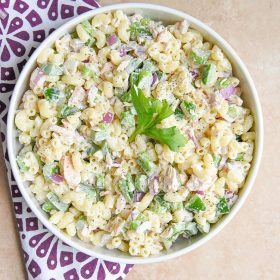 This is my mother’s tuna macaroni salad recipe and I haven’t changed anything aside from the red onion, it reminds me of her so much and it’s really the best tuna macaroni salad I’ve ever eaten. How do you make tuna macaroni salad? First, start by boiling your desired amount of pasta. 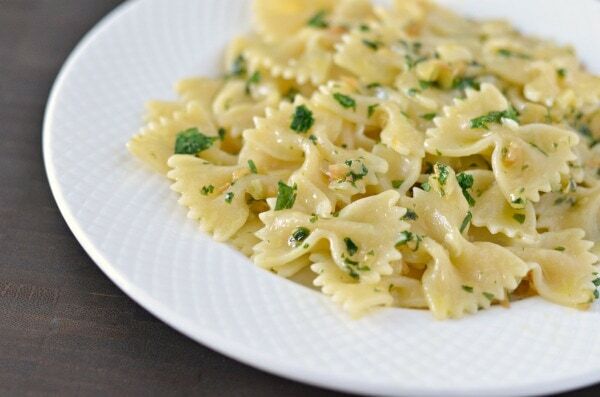 While the pasta is cooking you can chop up the pepper, celery, and onion. 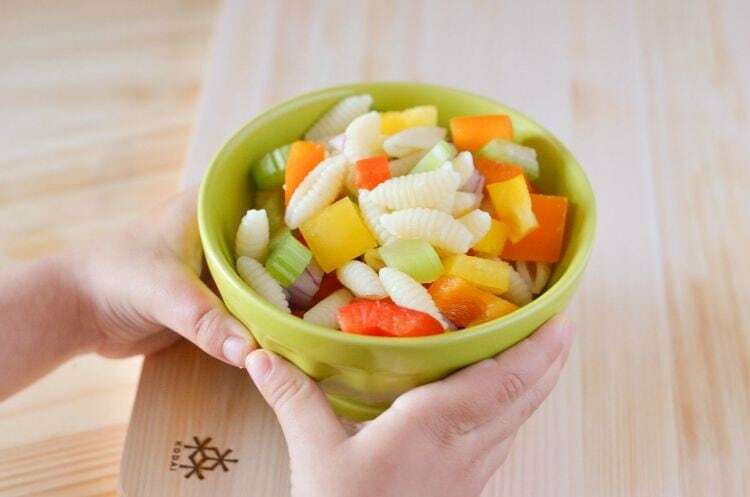 Mix the pasta, chopped veggies, mayo, and salt and pepper in a large bowl until combined. 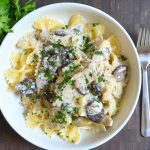 How do you make tuna pasta with mayo? Mayo REALLY makes this salad. It’s the binder and it’s the flavor too! We prefer real mayo for our tuna macaroni salad. You can use other binders like yogurt, sour cream, but mayo is our choice. You can add as much or as little mayo as you like, you can always add, but you can’t take out like my grandma said. So if you like a creamy tuna macaroni salad just add more mayo. 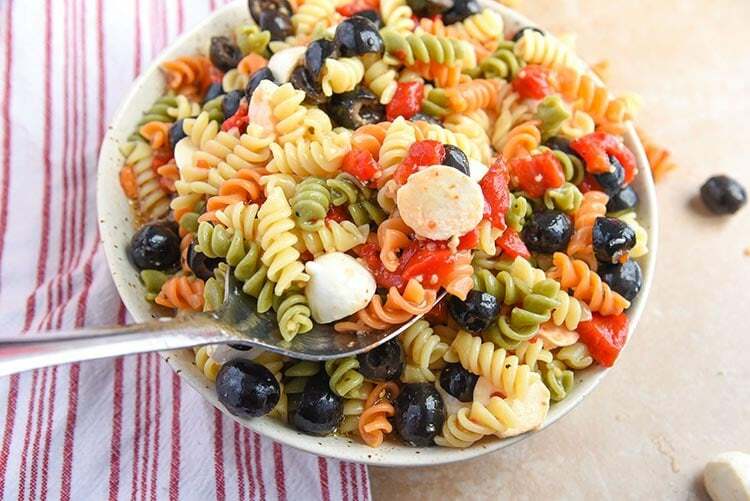 We just mix it in with our pasta salad ingredients and then place it right into the refrigerator. 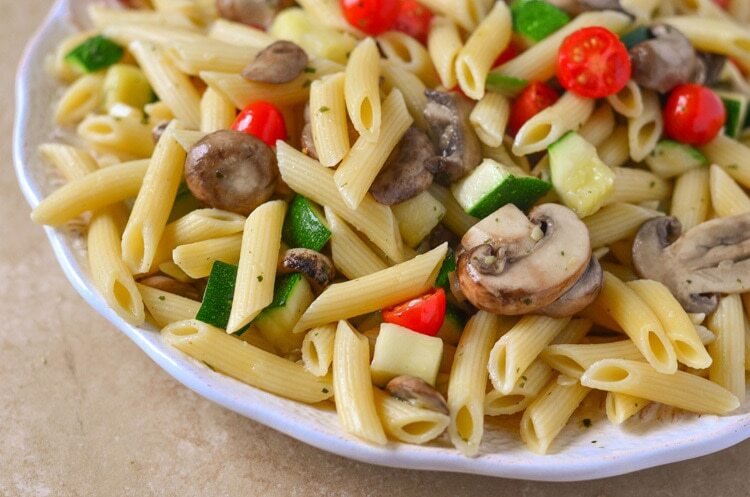 Since this pasta salad has mayo it’s important to keep it chilled. Does tuna have mercury? Why does tuna have mercury? Here’s a great article from Chris Kesser that eased my fears. I found myself asking these questions when I became pregnant and my doctor told to not eat tuna or a few other fish as they contain high levels of mercury. Safe catch tuna is said to have the LOWEST mercury levels of any tuna brand. They thoroughly test every tuna and ensure it’s levels are the lowest and safest for children and women during pregnancy. This isn’t to say that other tuna is bad, it’s just that you need to limit yourself with brands that have more mercury. Chunk light will have less mercury than solid. My favorite way is to eat tuna is tuna and macaroni salad. I was missing it for sure while pregnant, but now I know there are better options for myself and my family. 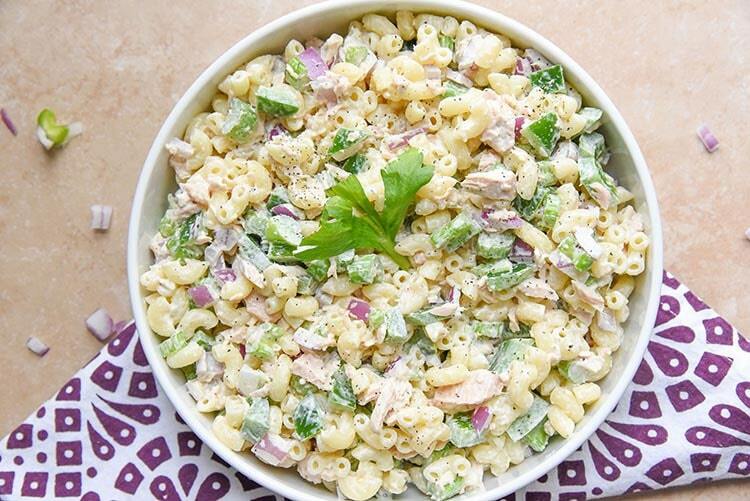 Tuna Macaroni Salad can be made in less than 15 minutes! 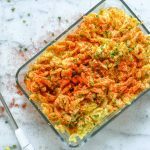 It's a versatile recipe meaning if you don't want to make macaroni salad with tuna you can swap in chicken or even leave the protein out. Great for potlucks, keep it chilled as it's a cold tuna macaroni salad with mayo. Mix together all of the ingredients until well combined. Salt and pepper to taste and refrigerate until serving. This recipe is best served cold. Please remember to keep this product chilled if it's outside as mayo can spoil quickly. 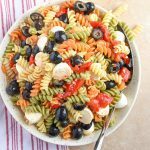 LOVE Pasta Salad Recipes or just plain old Pasta Recipes? Here’s a few more! 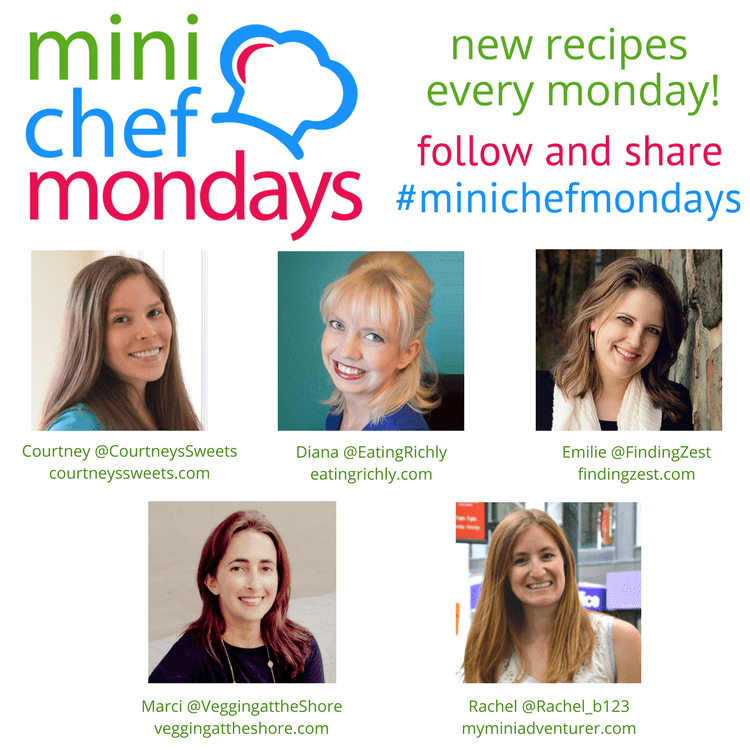 I am hosting Mini Chef Mondays along with 4 fabulous bloggers, find out more about the Mini Chef Mondays Team!Join our facebook group to find even more recipes and share your own recipes! I know this might sound like a dumb question; but it doesn’t say if you are suppose to drain the tuna or not. Ack! Yes, we do drain our tuna! Thanks for catching, I just updated. That being said, my mother would sometimes leave it in. 🙂 If you want it a little more watery you could skip draining. 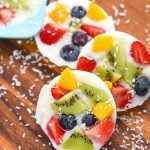 This is perfect for spring cookouts! We are lucky our weather is typically mild enough to be outside much of the year. 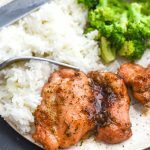 Such a great recipe, and I love how easy/quick it is to whip up! I can’t believe I never thought to combine tuna salad with macaroni salad. SO good!